Working intensively on a computer and browsing the Internet are usually the main reasons why a computer's performance deteriorates over time, and works a lot slower as days go by. 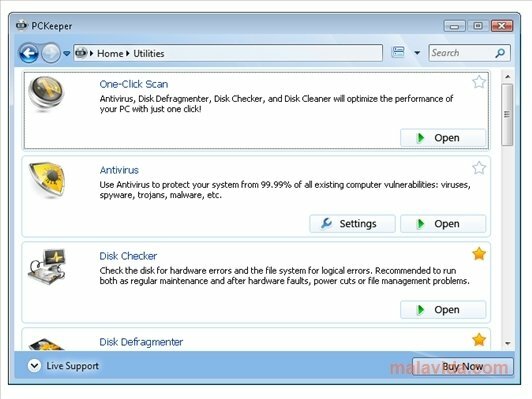 To be able to stop any of these problems it is important to have various tools available or, if you prefer otherwise, to install PCKeeper on your computer. This tool is capable of protecting you against various kinds of threats (virus, spyware, identity thefts,...), allowing you to analyze your storage units, recover accidentally deleted files, uninstall applications, manage the Windows Startup or defrag hard drives, among other things. The program's interface is rather intuitive, and the vast majority of Windows users shouldn't have any problems at all when it comes to handling the application, because it has a graphic environment that is identical to that of the File Explorer of the Microsoft operating system. Discover a tool that is ideal to keep your PC in perfect conditions, thanks to PCKeeper. This download requires an Internet connection to install the program. The trial version can be used for 15 days.